The South African Scout Association is the World Organization of the Scout Movement recognized Scouting association in South Africa. Scouting began in the United Kingdom in 1907 through the efforts of Robert Baden-Powell and rapidly spread to South Africa, with the first Scout troops appearing in 1908. South Africa has contributed many traditions and symbols to World Scouting. The South African Scout Association caters for youth and young adults from the age of 8 till 30. It is split into three sections, namely Cubs, Scouts and Rovers, with each section serving a different age group, and concentrating on different areas of personal development. It is also one of the largest youth organisations in the rural parts of South Africa and performs many community upliftment programmes in those areas. The highest award attainable by a Scout in the South African Scout Association is the Springbok award. A Scout is required to complete all the requirements for the Springbok award before their 18th birthday. The Aim of the South African Scout Association is to contribute to the development of boys, girls and young adults in achieving their full potentials as individuals, as responsible citizens and as members of their local, national and international communities by developing their character, training them in citizenship and developing their spiritual, social, mental and physical qualities. The South African Scout Association is based on the principles of duty to God, duty to others and duty to self. These three principles govern the entire advancement programme and teach the Scout to be loyal to the religion that expresses them, to be loyal to the country in which they reside and to be responsible in their own development. Organized Scouting spread to South Africa only a few months after its birth in Britain in 1907. In 1908, several troops formed in Cape Town, Natal and Johannesburg and the following year saw the first official registration of South African troops. Scouting in South Africa grew rapidly, and in 1912 Baden-Powell visited South African Scouts. Due to the rapid spread of Scouting it became necessary to provide some form of local coordination. Provincial Councils were formed in South Africa between 1912 and 1916. These councils had no direct contact with each other and reported directly to Imperial Scout Headquarters in London. The first Union Scout Council was formed in 1922 to provide a common national control on an advisory basis. Six years later, in 1928, the Union Scout Council adopted a constitution which enabled it to perform the functions of Imperial Scout Headquarters. Scouting in South Africa, as in most British Colonies (such as Rhodesia), was originally segregated by race. This did not prevent Black Scout groups from springing up, with the Pathfinder Council being formed in 1929. In the 1920s, Black Scouts were given the name Klipspringers (rock-hoppers, referring to a type of small antelope). In 1930, the Imperial Scout Headquarters granted the complete independence of the Scout Movement in South Africa. Work started on yet another constitution which was finalised in 1936 at Bloemfontein during the visit of Baden-Powell. During 1937, the Boy Scouts Association of South Africa became a member of the International Scout Conference (now World Scout Conference) and was registered with the International Bureau (now World Scout Bureau) on 1 December 1937. South Africa was the first of the Commonwealth countries to achieve independence for its Scout Movement. The now independent association maintained the racial segregation with four separate associations. After consultation with Baden-Powell, four separate Scouting organisations were created in 1936. These were The Boy Scouts Association (for whites), The African Boy Scouts Association (for blacks), The Coloured Boy Scouts Association (for coloureds) and The Indian Boy Scouts Association (for Indians). A revision of the 1936 constitution in 1953 even strengthened the whites-only branch: Its Chief Scout was now Chief Scout of the three other associations with Chief Scout’s Commissioner as executive heads. With the rise of Afrikaner nationalism in South Africa during the early part of the 20th century, Scouting was viewed with suspicion by many Afrikaners because of its English roots, and rival Afrikaans organisations including the Voortrekkers were established. These had a strong social and political aim. Negotiations about an amalgamation of both movements in the years 1930 to 1936 were not successful. In the 1970s, the Nordic countries placed pressure on the World Organization of the Scout Movement (WOSM) to expel the South African Movement for its racial policies. South African Scouting responded to this by combining all branches of the Movement into a single Boy Scouts of South Africa organisation at a conference known as Quo Vadis that was held on 2 July 1977. The Apartheid laws of this time made any form of multiracial gatherings illegal, yet Scouting activities continued in defiance of these laws. However, the Apartheid government did not take any action against the Movement. Scouting was active during the period in several of the homelands, Transkei issuing Scout insignia and several including Bophuthatswana (the homeland where Mafikeng is located) issuing Scout-themed postage stamps. On 10 July 1995, The Boy Scouts of South Africa adopted a new constitution and changed its name to the South Africa Scout Association. The Association also began accepting girls into its ranks. By 1999 girls were allowed in all sections of the Association. South Africa has long been associated with the origins of Scouting. Robert Baden-Powell, the founder of the movement, spent most of the years from 1884 to 1905 as a soldier in Southern Africa. South Africa's most prominent role in the origin of Scouting was the Siege of Mafeking in 1899-1900. Baden-Powell successfully lead the defence of the town for 217 days. During the siege, he was inspired by the boys of the Mafeking Cadet Corps, and later used them as an example of bravery in the first chapter of his handbook Scouting for Boys. The Mafeking Cadets are not regarded as the first Boy Scouts, as Scouting was only born later, in 1907 at Brownsea Island in Britain. However, it was Mafeking that resulted in Baden-Powell becoming a national hero in Britain, and it was his fame that enabled his Scout movement to catch on so rapidly. The Wood Badge, worn by adult Scout leaders, is a replica of beads from the necklace that was once worn by King Dinizulu of the Zulus. 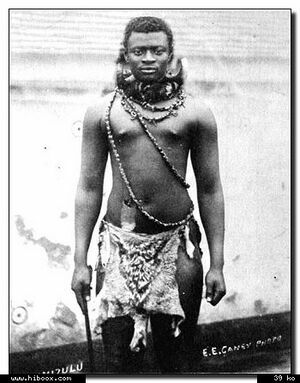 The original necklace was captured from Dinizulu by Baden-Powell. Other Zulu traditions and chants also featured in Scouting for Boys. While serving in Southern Africa, Baden-Powell learnt many the skills that would become standard scouting skills. Jan Grootboom, a Xhosa from South Africa, was a military scout who Baden-Powell praised for his scouting ability in the Matabele Campaign. Baden-Powell also learnt scouting skills from Frederick Russell Burnham, an American explorer, adventurer and mercenary, who went on to become a highly decorated Major and Chief of Scouts under Lord Roberts during the Second Boer War. The earliest Scout uniform was based on the uniform that Robert Baden-Powell designed for the South African Constabulary, a paramilitary force established to police the conquered Boer republics following the Anglo-Boer War. The current South African Scout uniform is in fact still based on the uniform worn by the South African Constabulary. The Association is actively involved in community work, particularly in the rural areas of South Africa. In some rural areas, such as the greater Tzaneen area, there are Troops with over 100 scouts. Rural Troops are often limited in their activities by funding and lack of equipment. Their programme focuses on educating the Scouts in becoming good citizens and in the dangers of HIV. Educating Scouts in HIV and AIDS is vitally important due to the large number of infections in both rural and urban areas of South Africa. “ The international Scout movement is a world leader in youth education, and has particular relevance to the needs of youth in Africa and the emerging democracies around the globe. I am pleased with the progress of Scouting in South Africa, and in the steps which are now being taken to make the programme accessible to more young people. The importance of a high moral code, which is at the foundation of the Scout movement, cannot be stressed too highly. The Association runs a programme known as The Phakamani Project aimed at enabling any boy or girl anywhere in the country to become a Scout. Phakamani is a Nguni word for Rise. The Phakamani project is designed so that groups in the community wishing to try out the Scout programme as their own youth programme are able to do so easily and informally. Through promotional presentations using videos and support literature, communities are encouraged to form committees, and informal Scout units can start without further regulation. The desire to register as Scouts will follow. The Association is divided into seven Areas, namely Cape Eastern, Cape Western, Central, Gauteng, KwaZulu-Natal, Mpumalanga and Northwest. Each Area is in turn divided into Districts, and each District consists of a number of Groups. Groups normally have a Cub section and a Scout section. Rover crews are either associated with an Area, a District, or a Group. The national head office of the Association is in Cape Town. The Chief Scout is the head of the South Africa Scout Association, and is therefore the leader of Scouting for all groups within South Africa. The current Chief Scout of the South African Scout Association is Reverend Vukile Mehana. Former President of South Africa Nelson Mandela is the patron of the South African Scout Association. The Group is lead by a Group Scouter (GS) who acts as the liaison between the parents committee and the adult leaders of the Cub, Scout and Rover units within the Group. The parents committee is an elected body of Scout and Cub parents (with elections being held once a year at the Group AGM) that oversees the financial, maintenance and legal affairs of the group, thereby leaving the adult Scouters to concentrate on the Scout and Cub programme. Scout Groups consist of various units of different age groups who meet at a common venue (normally a Scout hall) and share a common name. Generally Scout Groups are split into a Cub Pack, a Scout Troop and possibly a Rover Crew. Large Groups may have more than one of each section, or may have separate units for boys and girls. The Cub section is open to boys and girls between the ages of 8 and 10½, and is intended to lay foundations and teach basic skills for when a Cub becomes a Scout. The Cub programme is based on a system of progressive leadership, with members being given increasing responsibility depending on age as they advance through the Cub Pack. Cubs are divided into small groups called Sixes led by a Sixer and a Seconder. The Pack Scouter may appoint the most responsible Cub in the Pack as a Senior Sixer. The head of a Cub Pack is the Pack Scouter (PS), often nicknamed Akela after the head wolf in The Jungle Book by Rudyard Kipling. There may be a number of Assistant Pack Scouters, with nicknames from other Jungle Book characters. The Cub Advancement Programme is based on Cubs working towards the Cheetah, Lion, Leopard and Leaping Wolf badges. Cubs proceeding to Scouts complete the Link Badge. The Scout section is open to boys and girls between the ages of 11 and 17, and aims at developing Scouting and leadership skills. Scout Troops are divided into Patrols of between four and ten Scouts, with six being a common size. The Patrol Leader and Second have many responsibilities in training younger Scouts and helping plan and run the programme. Patrol Leaders are in charge of planning and running (often with no adult intervention) Patrol camps and outings, they are also required to assist their Patrol members through the Scout advancement program. Often the most senior and responsible Patrol Leader is appointed as Troop Leader (TL), who no longer runs a Patrol but instead has other responsibilities such as enforcing discipline and running the weekly programme. Since a Troop Leader is not required to plan or run Patrol camps, or help Scouts through the advancement program many senior Scouts who are in their final year of school choose to become Troop Leaders in order to have more time to concentrate on their studies and on achieving the Springbok award. The adult leader of a Scout Troop is the Troop Scouter (TS), assisted by Assistant Troop Scouters (ATS) and Junior Assistant Troop Scouters (JATS). Scout Troops often give their adult leaders nicknames related to their branch of Scouting (Land Scout, Air Scout or Sea Scout). Patrol Leaders, Troop Leaders and the Troop Scouter should meet regularly in the Patrol Leaders' Council, also known as the Court of Honour, where they are responsible for the majority of decisions regarding troop discipline, patrol management, troop programme and such. The Troop Scouter is the only adult leader regularly attending these meetings, and has the right to veto decisions. The Troop Scouter generally only acts in an advisory role, allowing the Scouts themselves to make important decisions. The Court of Honour may invite the Assistant Troop Scouters in order to hear their input. The Scout Advancement Programme is based on a number of advancement badges, culminating in the Springbok Scout badge. Each advancement badge focuses on different levels of development and the programme progresses from basic Scout training, to training young Scouts and ends with a large focus on community service. In order to be invested as a Scout, the membership requirements for recruits include knowing the basic story behind Scouting, the Scout Promise and Law, some basic scouting skills, and the National anthem of South Africa. This is the first real advancement badge. It focuses on basic Scout training, including the six basic knots (Reef Knot, Bowline, Sheet bend, Sheepshank, Figure-of-eight and Clove hitch), basic first aid (treatment of open wounds and bleeding), and introduces Scouts to camping. The badge encourages a Scout to participate in patrol activities. The Scout is required to have camped away from their normal Scout meeting place for at least 5 nights. This advancement badge introduces the Scout to basic pioneering, including whipping, basic lashing and other advanced knots. The Scout is required to know more advanced forms of first aid (treatment of shock, sprains and fainting). The Scout needs to help plan, and be second in charge of a patrol hike. Other requirements for the badge include knowledge of HIV/AIDS and knowledge of how a Court of Honour functions. The Scout is required to have camped away from their normal Scout meeting place for at least 10 nights. This advancement badge is the first advancement badge that places the Scout in a position of leadership and organisation. A Scout is required to plan and run a wide game for their Patrol, a Patrol camp, an overnight Patrol hike for which a log book must be written, a programme to teach younger Scouts in their Patrol about pioneering and they need to assist in the planning of a Scouts Own. The Scout also needs to lead their patrol in a community service project of not less than 10 hours and is required to have camped for at least 15 nights. The Explorer badge is split into three different badges for the three different Scouting sections (Land Scouts, Air Scouts and Sea Scouts). The Explorer badge teaches the Scout to take control of situations, and places the Scout in positions where they need to plan and run large scale activities for the entire troop. The Scout is required to plan and run an orienteering wide game for the entire troop, an incident hike for their Patrol, a Patrol expedition and a troop camp-fire. The Scout is required to achieve six different interest badges from the Scout Badge Book. While Scouts are encouraged to achieve as many interest badges as possible, they are only required to achieve the six that is needed for their Explorer badge. There are three compulsory badges for each type of Explorer badge. Most scouts choose to work on the Explorer badge that is related to the section of Scouting their Troop belongs to, but there is no reason why a Scout can not do an Explorer badge from another section. The only difference between the three Explorer badges is the 3 compulsory interest badges that are required, and the design of the badge. This badge is the top Scout award in Scout Africa. It concentrates on teaching the Scout how to give back to the community. Among the requirements, the Scout must complete at least 40 hours of community service, lead a hike of over 30 kilometres in unfamiliar territory, and plan and construct a large pioneering project. The Springbok Antelope|Springbok is a small gazelle that is common to dry inland areas of Southern Africa. The Springbok was the national symbol of South Africa during the Apartheid era, and is currently the national animal of South Africa. The Springbok award is the equivalent of the UK's Queen's Scout and the American Eagle Scout. The Rover section is open to any young adults between the ages of 18 and 30. The Rover programme focuses on service to others. Rovers are not necessarily adult leaders of Scout Troops, although there is often some overlap. The Rover section has historically been open to young men and women, even prior to Cubbing and Scouting being opened to girls. The purpose of Rover Scouting is to encourage Rovers to train themselves and their fellow Rovers in citizenship and service, to encourage Rovers to pursue careers that they enjoy and that are useful to themselves and to render services to both the Scout Movement and the Community around them. After three months of joining a Rover Crew a newcomer can be invested as a Squire. If the newcomer was not previously a Scout, he or she must first be invested as a Scout and must take the Scout Promise. The Squire then chooses a mentor (called a Sponsor) from one of the existing Rovers, the Sponsor's task is to guide the Squire in learning all the necessary Scouting skills and to aid the Squire in performing a service project as set out by the Rover Crew. Once the service project is completed the Squire can be invested as a fully fledged Rover Scout. Rover Scouts also have eight different awards that they can strive for, if a Rover holds at least four awards he or she may be nominated to receive the B-P award which is the highest award a Rover can receive. The South African Scout Association runs SANJAMB, the South African National Jamboree, approximately every four years. The Senior Scout Cederberg Adventure is held every two years in the Cederberg mountains. A large number of rallies, activities, competitions and training courses are held by the different Areas. The biggest of these are probably the Kon-Tiki raft building competitions held annually in Cape Town and Gauteng. These are in addition to the activities run by each Scout group. Lexden Woggle worn by PLTU attendees. 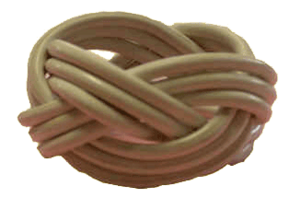 The woggle is a five-turks head knot with three strands, and is usually made from white plastic insulated wire. The Patrol Leaders Training Unit (or PLTU) is a 7 to 12 day course run at various venues around South Africa. PLTU is a very physically and mentally strenuous course, open to Scouts who are over 14½ years old and have achieved their Adventurer advancement badge. The first of what was to become the Patrol Leader training Unit courses was run at Lexden - Natal Gilwell Scout Training Camp in July 1959, under the leadership of Dudley Forde, with 19 Scouts from the 2nd Durban Y.M.C.A. Scout Group in attendance. Courses were offered to boys from the same Group over the next five years until the 6th Course in October 1964 which was opened to participants from South Durban District. In October 1967 the Patrol Leader Training Unit was formed to offer formal Leadership Training courses for Scout Patrol Leaders in the then Natal Division. The nine members comprising the original Unit were;Dudley Forde [Chairman], Fr Ian Laurenson, Lynn Reynolds, Paddy McDowell, Paul and Helen Bezencon,Iand Hoare, Tony Hornby and Bill Sewell. The Kwa-Zulu Natal Area Patrol Leader training Unit celebrated the holding of its 100th course in July 2004. Dudley Forde, Fr Ian Laurenson, James Radford, Bryan Dibben, Craig Shaw, Grant Martens and Guy Caws have led the fortunes of the Unit over its first 45 years. This Unit is proud to have hosted and mentored those who went on to create Patrol Leader Training Units in other centres in South Africa: Ian Hoare - East London, Derek Swemmer - Pretoria, Lynn Reynolds - Free State, Bill Hodges and Bruce Marree - Eastern Cape, Ian Harry and Chris Barrett - Gauteng, Peter Foster - Western Cape. A typical PLTU course focuses on character development in each individual, including the development of physical, mental and spiritual qualities. Qualities such as leadership and team spirit are instilled in the Scouts during the course. On the successful completion of a PLTU course a Scout is entitled to wear a PLTU woggle (which is made by the Scout while on the course) and to wear a special PLTU badge on their uniform. Many Troops also require a Scout to complete a PLTU course before allowing them to become a Patrol Leader. The South African Scout Association plays an active role in the Southern Africa Zone, consisting of all the WOSM member Scout Associations in the Southern Africa region. The Africa Scout Region has a satellite office in Cape Town at the South African Scout Association headquarters. A number of European Scout Associations are involved in North-South partnerships with Scouts in developing countries, including several active programmes in South Africa. 20px Members of the Boy Scouts of America living in South Africa may become Lone Scouts Boy Scouts linked to the Direct Service branch of the BSA. The Join-In Jamboree concept, for Scouts in their home countries during World Scout Jamborees, was pioneered by the South African Vic Clapham in the 1970s. Vic Clapham was awarded the Bronze Wolf, the only distinction of the World Organization of the Scout Movement, by the World Scout Committee for exceptional services to world Scouting. In 1971, former Chief Scout Arthur Johnstone was also awarded the Bronze Wolf. Colin Inglis and Garnet de la Hunt, both former Chief Scouts of South Africa, were awarded the Bronze Wolf in 1996 for their work towards racial unity in Scouting during the apartheid era. Frank Opie, a South African Scout leader and environmental educationalist, published The Global Scout on behalf of World Scouting in 1993. The South African Scout Association hosted the World Scout Conference and World Scout Youth Forum in Durban in 1999. Garnet de la Hunt chaired the World Scout Committee from 1999 to 2002, and former Chief Scout Nkwenkwe Nkomo was elected to the World Scout Committee in 2005. ↑ "Policy, Organisation and Rules". South African Scout Association. 2003. http://www.scouting.org.za/library/por/. Retrieved 2006-11-16. ↑ 2.0 2.1 Introduction to Adult Leadership. Cape Town: South African Scout Association. 1995. ↑ 3.0 3.1 3.2 3.3 "History of Scouting in South Africa". History of Scouting in South Africa. South African Scout Association. 2006. http://www.scouting.org.za/visitors/history.html. Retrieved 2006-11-30. ↑ 4.0 4.1 Boy Scouts of South Africa (1957). The History of Scouting in South Africa. Boy Scouts of South Africa. pp. 96. ↑ 5.0 5.1 Heale, Jay (2003). What is Scouting? A guide to the aims, history, principles, and methods of the South African Scout Association. South African Scout Association. ISBN 0-947005-38-2. http://www.scouting.org.za/library/whatisscouting/WhatIsScouting.pdf. Retrieved 2007-01-13. ↑ Inglis, Colin (May 1994). "Scouting in South Africa". Australian Scout. ↑ "First Scout Postal Cancels by Country" (Template:DOClink). Scouts on Stamps Society International. 1999. http://www.sossi.org/postmark/firstcancels1099.doc. Retrieved 2006-11-17. ↑ "Gilwell Reunion". Scouts on Stamps Society International. http://www.sossi.org/woodbadge/wb2.htm. Retrieved 2006-11-17. ↑ "Constitution of the South Africa Scout Association" (105KBPDF). The South African Scout Association. 2003. http://www.scouting.org.za/sasa/constitution.html. Retrieved 2006-11-16. ↑ "The Mafeking Cadets". Scouting Milestones. "Johnny" Walker. http://www.scouting.milestones.btinternet.co.uk/cadets.htm. Retrieved 2006-11-17. ↑ "The Origins of the Wood Badge" (303KBPDF). The Scout Association. 2003. http://www.scoutbase.org.uk/library/hqdocs/facts/pdfs/fs145001.pdf. Retrieved 2006-11-16. ↑ Baden-Powell, Sir Robert (1915). "My Adventures as a Spy". PineTree.web. http://www.pinetreeweb.com/bp-adventure01.htm. Retrieved 2006-11-17. ↑ "Frederick Russell Burnham". PineTree web. http://www.pinetreeweb.com/burnham.htm. Retrieved 2006-11-16. ↑ "Scouting in South Africa". The World of Scouting. n2zgu.com. http://n2zgu.50megs.com/RSA.htm. Retrieved 2006-11-16. ↑ "Scouting and AIDS". Scouting and AIDS. South African Scout Association. http://www.scouting.org.za/resources/aids/. Retrieved 2006-11-17. ↑ "South African Scout Association". Home Page. South African Scout Association. http://www.scouting.org.za/sasa/. Retrieved 2006-11-17. ↑ "The Phakamani Project". South African Scout Association. http://www.scouting.org.za/sasa/phakamani.html. Retrieved 2006-11-17. ↑ "South African Scout Association". South African Scout Association. http://www.scouting.org.za/sasa/. Retrieved 2006-11-17. ↑ "The Cub Trail". South African Scout Association. http://www.scouting.org.za/library/cubtrail. Retrieved 2006-11-17. ↑ "Law and Promise". South African Scout Association. http://www.scouting.org.za/library/lawandpromise.html. Retrieved 2006-11-17. ↑ "Scout Advancement Programme". South African Scout Association. http://www.scouting.org.za/library/scoutadvancement. Retrieved 2006-11-17. ↑ "Scout Badge Book". South African Scout Association. http://www.scouting.org.za/library/scoutbadgebook. Retrieved 2006-11-17. ↑ "The Rover Handbook". South African Scout Association. 2006. http://www.scouting.org.za/library/roverhandbook/. Retrieved 2006-11-30. ↑ "Cape Western Scouting, Gilqua PLTU - Patrol Leader Training Unit". South African Scout Association. http://www.scouting.org.za/capewest/pltu/. Retrieved 2006-11-16. ↑ "Gilten PLTU". Gauteng Scouting. http://www.gauteng.scouting.org.za/pl/index.php. Retrieved 2006-11-16. ↑ "Welcome at Nangu Thina". Southern Africa-Europe Partnership. http://www.nangu-thina.de/GB. Retrieved 2006-11-16. This page was last edited on 15 February 2015, at 19:47.